This is Ellie’s story, as told by Zoe Rosenberg, a phenomenal activist who founded Happy Hen Chicken Rescue in San Luis Obispo, California when she was just eleven years old. Zoe: Ellie has taught me to keep moving forward even when life seems hard. If you just keep going you may just find safety, freedom, and happiness." 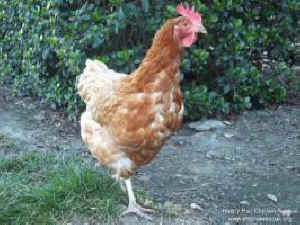 Ellie was saved from an egg farm. 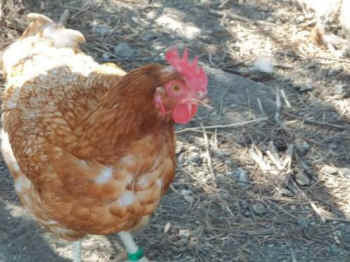 She was imprisoned in a battery cage and exploited for her eggs. When her production declined, she was going to be gassed to death. People intended to come into her barn, pull her from her cage, and shove her into a gas chamber. Instead, she was lifted out of the cage by kind hands and placed in a crate. 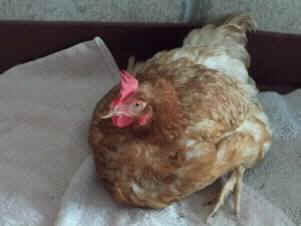 She was taken to Happy Hen Chicken Rescue, where she would be safe, happy, and free. Ellie was weak. The farm had cut her nerve-filled beak so short that she couldn't even eat. She was starved. She could not walk or even stand. Her bones were weak from over-production— she needed so much calcium to produce an egg a day that her body was taking it from her bones and muscles. We had to give her wet food so she could eat, along with calcium supplements. She was in our chicken ICU for about eight weeks. Ellie roaming around, enjoying her new freedom. Ellie hanging out in the shade at Happy Hen. Today, Ellie is happy and healthy. She roams around the sanctuary during the day, and sleeps in a cozy barn at night. Ellie enjoys digging in the dirt, taking dust bathes, and lying in the sun— all things that were denied her at the farm. She has made lots of friends and never wanders too far from her flock. Although Ellie prefers to be left alone, she has learned that we aren't going to harm her and doesn't run away. She trusts us and always looks forward to her fresh produce. To help hens like Ellie you can make a life-saving donation, sponsor Ellie or one of her friends, or volunteer at Happy Hen Chicken Rescue. Ellie has taught me to keep moving forward even when life seems hard. If you just keep going you may just find safety, freedom, and happiness.